Fascinum is a Yahoo Hack, that became a Google Hack in 2004 after Google’s IPO. It shows in real-time the news pictures the most viewed on different national news feeds. The viewer surfs at the top of the infotainment wave and experiments in a panoptic view the paradoxes of the unique thought. Installation n°1 on 5 is property of the Beep/DataLogic Collection and was acquired for the ARCOmadrid prize 2007. Installation n°2 on 5 is property of Collection Alain Servais. Installation n°3 on 5 is property of Collection Amaury De Solages. 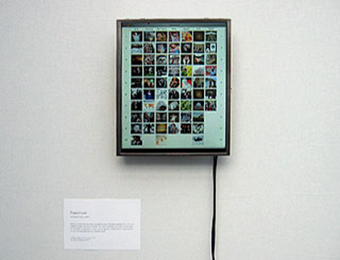 “Fascinum is an Internet installation that shows the pictures from the daily news that are the most viewed (ranked from 1 to 10) on different national Yahoo websites, in real time. The viewer surfs on the infotainment tsunami and experiences the paradoxes of global thinking in a blink. This real-time vision of the topics of fascination of mankind echoes the idea of the Panopticon, a type of prison conceived by English philosopher Jeremy Bentham at the end of the Enlightenments. Its concept is to allow an observer to watch over all prisoners without the prisoners being able to tell if they are being observed or not. This “sentiment of an invisible omniscience” is to be compared with the trends that are unveiled by the global symbolic structures like Yahoo and Google as models for our contemporary and near future society, of our popmodernity. Of course the difference with the Panopticon is that here, you are also the observer of your own fascination, as victim and accomplice of the global snuff movie. You are both the warden and the prisoner. You are mashed-up and torn apart between spectacle and control. Glance looks at itself. Alessandro Ludovico: ‘Fascinum’, addresses the most viewed news pictures and anticipated in a way the ‘most popular’ section on Flickr. How much are we looking for sign and pictures we need to belong to? Christophe Bruno: Fascinum is a Yahoo Hack. Back in 2001, Yahoo was already accounting for the gaze: they had a ‘most popular’ section, one for each country, and what I did was just putting the different countries together, into one grid. This allows one to make the connection between accounting and globalization. I think it’s important to understand the little difference with the ‘most popular’ section on Flickr. In Flickr, the ‘most popular’ seem to arise from the inside by an inner selection process. But in Fascinum, images explicitly come from the news, which are first broadcast by big media, and they are mashedup and digested by the Web only afterwards (well at least it was so in 2001 because there was no Web 2.0, nowadays it might be a little bit different). As I explained in question 1, I think this interplay between ‘big media’ and the Web (2.0) is fundamental. Of course it would be very interesting to see what happens to the Web, if the initial spectacle excitation vanishes. What would emerge from this quantum vacuum? For now, it’s hard to do this experiment; it would imply for instance to implement flickr in a spectacle-free society, I don’t even know what it means… Still, one can try to send infinitesimal perturbations (is that dandyism or particle physics?) and see how the medium fluctuates and reacts (what I tried to do in the Google Adwords Happening or in another piece called Hapax). One of the most impressive experiment I know about that, is the milliondollarhomepage, where the vacuum creates its own pop-tsunami. From these considerations I think one may understand how at the end, the gazing subject will be divided between on the one hand, a fluctuating deadly whole he mistakenly feels he belongs to, and, on the other hand, a vacuum-like external excitation, which triggers a fascinating inaccessible global peep-show.